Ever wanted to write "morning pages"...3 pages a day...that guest post you said you'd do for me 6 months ago...your life story? Just need to clear your writing throat or get started? Warm up your writing muscles? Here comes 750 Words, a nifty website that prompts you to write 750 words a day--about 3 pages--that's seen by you and only you. 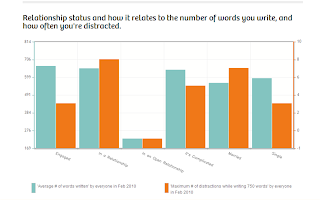 What's more, as Gina Trapani notes in this Lifehacker post, the site includes wonderful graphics and engines that generate data about your words--the mood you're in or how distracted you were--as well as public data you can check out here about everyone's contributions. (Above, a shot of the chart that shows that distractions-while-writing are highest for folks who are married.) It will keep tabs on how long your 750 words took, when in that time period you were most productive, what your mood was and what (based on your words) was preoccupying you most, and show you graphs and charts about all that. You might want to use it as a mind-dump, or as a tool to measure your productivity as a writer, comparing when your output's highest to lowest, for example. The idea here is an unfettered, unpublished, unedited stream of words--and no one's looking. Check out this new tool and let me know what you think.